The Most Comfort. The Most Features. The Most Fun. The Polaris Breeze has more standard features than other vehicles in its class. And most of them are designed to make your life easier and your ride more comfortable. It’ll get you from hole four to dinner at five in comfort and style. Intended for private road use. Check local laws regarding street use. Plush, contoured cut-and-sew seating gives the best fit and feel to each passenger. Bench styling still allows for easy entry and exit from very spacious driver's cab compartment. 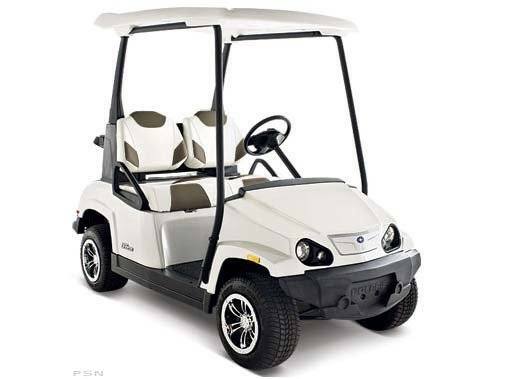 The Breeze™ comes standard with a 12V accessory outlet, full-width front bumper, 10 inch wheels, and premium hubcaps. See and be seen with bright headlights, 24 LED tail lights, and 360° reflection. Be confident in knowing your Breeze™ is supported by an American company with over 55 years of experience in building quality recreational vehicles. We're a recognized leader in ride and handling for both on-road and off-road vehicles so you can cruise confidently! Our suspension is an independent wishbone in front and a semi-independent three-link rear. Add in adjustable coil-over shocks on all four tires and the Breeze™ gives you superior suspension travel for the smoothest possible ride. The Polaris Breeze™ can get you up to 50 miles range on a single charge. After use, you can recharge its 6 / 8V battery package with the premium, portable charger that comes standard.